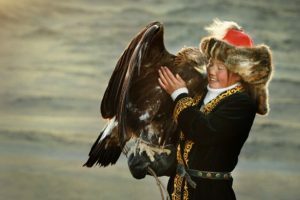 The Eagle Huntress is a documentary about a 12 year old girl in Mongolia who wants to be able to train and hunt with eagles like her father. All the old eagle hunters in the area are disdainful but her father agrees to train her. He sees how determined she is and their relationship is wonderful to watch. The eagles soaring and countryside are beautiful to watch and her achievement is uplifting. I liked it very much.